Posted on Fri, Mar 30, 2012 : 1:25 p.m. The Michigan basketball program took a major step forward this season, but ended the year with a large thud. In the end, does John Beilein see the 2011-12 campaign as a disappointment? "No," Beilein told Yahoo! Sports Radio on Thursday. "Absolutely not." Michigan basketball coach John Beilein. 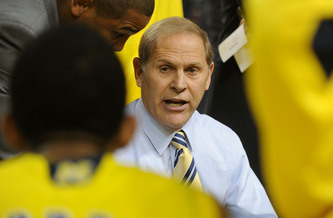 Beilein, who is in New Orleans at the 2012 Final Four, spoke with Yahoo! Sports Radio's Peter Brown about a number of topics, including how he's feeling after the Wolverines' early NCAA Tournament exit earlier this month. "We had a great group of young guys that played their tails off, we won a Big Ten championship, which has only happened 13 times in Michigan history," Beilein said. "(It) hasn't happened in (26 years). We feel good." The departures of Evan Smotrycz, Colton Christian and Carlton Brundidge were not among the topics discussed between Beilein and Brown. Nor was Beilein asked about the circumstances surrounding Michigan freshman point guard Trey Burke, who is currently deciding whether he'll return to school next season or opt for the NBA draft. Since the season ended on March 16, Beilein has not had media availability with local reporters. Earlier this week, Burke's father, Benji, told AnnArbor.com that he and his family were still awaiting word from the undergraduate advisory counsel with regard to Burke's NBA draft stock. On Thursday, he told The Associated Press that the family will take the weekend to discuss the process. As far as last season goes, Beilein was asked if the 2011-12 year was what he envisioned for the program when he took over the controls in 2007-08. In short, he said no, he still wants more. "I envision more," Beilein said. "We came (to Michigan) to have consistency and really win every year, and get eventually back to where you can get to the Final Four and win national championships." Asked if there was any extra pressure to win, and win big, at Michigan than there was at any of his previous stops, Beilein again said no. His goals have always been the same. "I don't feel any of that stuff," he said. "Once you get things going, whether it was at Richmond or Canisius or Le Moyne College in Syracuse, New York, I felt the same way. "I just wanted to get to the NCAA Tournament and have a chance to get to the national championship." Sun, Apr 1, 2012 : 1:46 a.m.
Don't Blame WV on this one.You Fans are just like Beilein,when you win your fine,but when you lose you point fingers.Do you really think your going to be something in Basketball in the Big Ten.You were lucky in Football this Year,to win 11 games but if you would of lost 7 or 8 games you would of blamed it on Rich.You tied for The Big Ten in Basketball,which again was luck.Then you lose in The NCAA to a MAC Team.You ever stop and think you OVER RATED IN BOTH FOOTBALL AND BASKETBALL. Sun, Apr 1, 2012 : 7:34 p.m. Sat, Mar 31, 2012 : 10:13 p.m.
A narrow-minded, one-dimensional coach from West Virginia who recruits undersized players.... where have I seen this before..... hmmmmm.. Sat, Mar 31, 2012 : 3:28 p.m.